Today is February 12 – otherwise known as Bell Lets Talk day. For those that know me well, I don’t think it’s a secret that I have struggled with depression and anxiety for years (or maybe it is – in that case, surprise!). There are times when things are quite manageable, and others that are so overwhelming that it is difficult, if not almost impossible, to function. I have felt alone. I have felt ashamed. I have felt . . . hopeless. All this in spite of having a very wonderful, amazing, fulfilling life! There continue to be days when I still feel those very same emotions; however thankfully, they do not happen often, and I have learned ways to cope and move forward. I am so very thankful for the Mental Health programs in my community. The individuals I have encountered have been supportive and understanding, and demonstrate a strong commitment to assisting others as they walk a dark, often lonely and confusing, path. They have made the journey through depression … bearable. When I am struggling, I want to disappear. I can’t speak for others; however from my observations over the years, I do not believe I am alone in wanting to fade away rather than put on a mask so others will feel comfortable around me or worse, recognize that I’m not okay. In our society, despite more education about mental illness, there remains a belief that there is something wrong with those who do not wear a happy face all the time. Don’t believe me? Look at how often we are told “Happiness is a Choice” (or words to that effect) whether in person or via social media. I can say with certainty that yes, happiness may be a choice; however there are other factors that often come into play that may inhibit ones ability to make that choice. It doesn’t mean that one is weak. It doesn’t mean that one is too lazy to do something different. It means that there is a genuine medical reason that is affecting their decision making. We wouldn’t tell someone “Running 100m is a Choice”, and then chastise them for not doing it because they have no legs, would we? No, we would talk about how we could support them to make the choice, and offer accommodations to help make it happen. The only difference is one condition is visible, the other is not. One condition is acceptable, the other, not so much. Do a little research. Take the time to learn about Mental Illness and share your learnings with others. Education goes a long way to reduce the stigma associated with Mental Health issues. 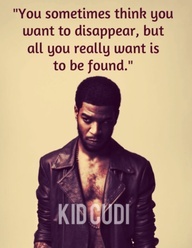 When you see someone trying to ‘disappear’, make the time to ‘find’ them. You don’t have to solve all their problems, just let them know you are there. That you care. That you accept them. That they are important. Reach out. Together, we can make a difference for people who are struggling. One kind word or act of caring can be the light at the end of a tunnel that someone desperately needs. We can offer support and understanding rather than fear and judgement. We can stand collectively and say we will not buy into the stigma surrounding mental illness, and make choices that reflect that. We can be there for one another when times are dark, just as we are there for one another in times of joy. We can support Mental Health initiatives in our community, and lobby our governments for the resources that are so desperately needed in this area. We can and will make a difference. If you, or someone you know is struggling with a Mental Health issue, you are not alone and there IS help available. Contact your local Mental Health centre, member of the Clergy, or Physician (even if it is a walk in clinic). Please, don’t get caught up in a game of hide and seek. Your health is too important. YOU are too important.